Two Cleveland physicians, Theodatus Garlick and H. A. Ackley, performed the first successful artificial fertilization of fish eggs in the United States in 1853. They later built the nation’s first fish hatchery. Garlick published results of their experiments in 1857 in the "Ohio Farmer," spreading the knowledge for others to use. His treatise on artificial fish propagation and pisciculture encouraged others to begin artificially breeding fish. Aquaculture experts today sometimes call Garlick the "Father of American Fish Culture." 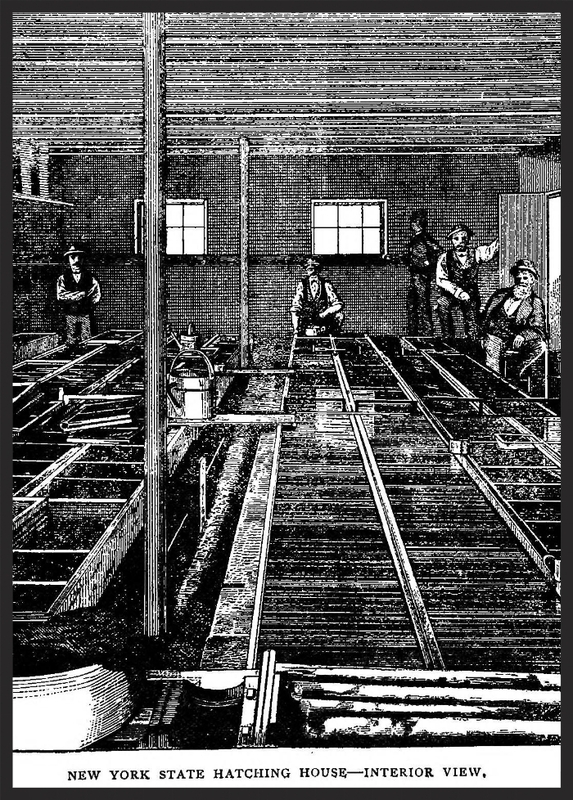 Garlick and Ackley laid the foundation for the modern fish farming, or "aquaculture," industry. Aquaculture means raising aquatic animals or plants in a controlled environment for all or part of their life cycle. Most aquaculture is for commercial purposes, with the produce sold for use in recreation, food, or other products. Aquaculture’s most popular fish include channel catfish, striped bass, rainbow trout, salmon, carp, and tilapia. Aquaculture also is a major source of water chestnuts, algae, water hyacinths, seaweeds, water lilies, and other wetland plants. Thousands of fish farms are thriving today as a result of their work, producing heart-healthy, high-protein food for millions of people. Fish farms raise about half the oysters and almost all the catfish, crawfish, and rainbow trout sold in the United States. Worldwide, fish farming accounts for more than 70 million tons of fish each year, and aquaculture is the great hope for supplying hungry people with nutritious seafood, as natural catches from the oceans decline. The State of World Fisheries and Aquaculture website offers more information. Artificial fish breeding in fish hatcheries also has become a key conservation tool. It allows restocking of natural populations of game fish that are depleted because of pollution and other problems. That helps sustain the sports fishing industry. Fishing is the nation’s 5th most popular participation sport, ranking ahead of biking, bowling, golf, in-line skating, jogging, tennis, and skiing. Only walking, swimming, camping, and exercising with equipment are more popular. Fishing enthusiasts spend more than $2 billion annually on tackle and other gear, and pump billions into the tourist industries in Ohio and other states. Garlick and Ackley helped start all that by showing for the first time that people could raise commercial quantities of fish through artificial breeding. Fish farming certainly was not new when the two doctors started their experiments. People in ancient Rome and China, for instance, raised carp, oysters, and other fish in artificial ponds. Ostia Antica, port for the ancient City of Rome, had huge fish ponds to assure consumers the freshest possible seafood. Garlick and Ackley, however, were among the first individuals in the United States to rediscover and extend this knowledge. Previously, fish farmers caught fish in the wild and transferred them to artificial ponds or other enclosures. Fish spent only part of their life cycle under artificial cultivation. Adult fish caught in the wild might be fattened or held for brief periods. Small fish, or fingerlings, grew to maturity. Imagine how expensive chicken or hamburgers would be if farmers had to start with wild birds or cows. Fish farming really began to make sense from a monetary standpoint after these Ohio inventors realized that fish could be raised in artificial environments throughout their entire life cycle. They worked with brook trout Salvelinus fontinalis, which "spawn," or reproduce, when the female sheds eggs into the water and the male fertilizes them. Garlick and Ackley removed eggs from a female trout and sperm, or "milt," from a male and combined the two so fertilization could occur. The fertilized eggs hatched into small trout, or "fry." They realized that the young fish could be used to stock fish farms, and built the first fish hatchery on Ackley's farm near Cleveland, which had 3 fish ponds. Theodatus Garlick and H. A. Ackley based their development of artificial breeding technology on the biology of fish reproduction. Not all fish, however, would have cooperated like the brook trout the Ohioans used in their experiments. Female trout lay eggs in the water, where males fertilize them. Sharks, however, use internal fertilization. Most sharks and a few other fish, including some popular aquarium fish, even give birth to live young. However, brook trout are the rule of thumb in the fish world. Fertilization occurs after the female spawns, or deposits eggs in the water. Marine, or salt-water, fish must lay millions at one time, assuring that at least a few survive to adulthood. Their eggs contain tiny droplets of buoyant oil that helps them float freely in the water, offering a tasty snack to other fish. Predators also gobble up many newly hatched fish. Most freshwater fish lay fewer eggs because they are better protected from predators. Their eggs have a sticky outer coating that clings to stones and other objects in the water. Many fish build "nests." They’re not elaborate like bird nests, but usually just shallow holes at the bottom, serving to keep the eggs in one spot and protect them. Some adult fish even guard the nests.